The Navy memorial table ceremony was conceived to honor those service men and women who are POWs, MIAs and no longer with us. There are several variations of this ceremony but the most common version is what was presented at our 2002 and 2004 reunions. 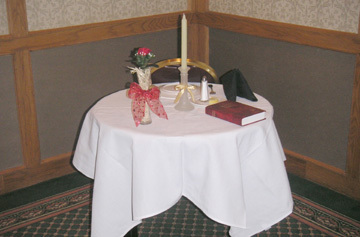 The table may have raised your attention -- it is reserved to honor our missing loved missing comrades. Set for one, the empty place represents Americans still missing. This Honors Ceremony symbolizes that they are with us, here in spirit. Some in this room were very young when they were sent overseas into combat; however, all Americans should never forget the brave men and women who answered our nation's call to serve and served the cause of freedom in a special way. "Click the link to play Eternal Father"
The table is smaller than the others symbolizing the frailty of one prisoner alone against their oppressors. The white tablecloth represents the purity of their response to our country's call. The empty chair depicts an unknown face, representing no specific Soldier, Sailor, Marine or Airman, but all who are not here with us. The table is round to show that our concern for them is never ending. The Bible represents faith in a higher power and the pledge to our country, founded as one nation under God. The black napkin stands for the emptiness these warriors have left in the hearts of their families and friends. The single red rose reminds us of their families and loved ones; and the red ribbon represents the love of our country, which inspired them to answer the nation's call. The yellow candle and its yellow ribbon symbolize the everlasting hope for a joyous reunion with those yet unaccounted for. The slices of lemon on the bread plate reminds us of their bitter fate. The salt upon the bread plate represents the tears of their families. The wine glass turned upside down reminds us that our distinguished comrades cannot be with us to drink a toast. Let us honor America's POWs, MIAs, and those who cannot be with us now and to the success of our efforts to account for them.